The Sperrins have certainly earned their stripes in the beauty stakes. Stretching from Strabane in County Tyrone to the shores of Lough Neagh in the east, Northern Ireland’s largest upland area is a designated Area of Outstanding Natural Beauty. National Geographic also thinks highly of its meandering, occasionally roller-coaster roads: it included them in its prestigious Top 101 Scenic Drives in the World. It might come as a surprise, then, that what was seen as an obstacle 400 years ago has blossomed into a major attraction. Back in 1609, representatives of the London guilds visiting Ulster were kept well away from these windswept hills ­– for fear that planting settlers would be deterred. The strategy worked: the settlers came. And today people still come. Pocketed with valleys and threaded with rivers and roads, the Sperrins have a wildness that makes them perfect for those who relish wide-open spaces. 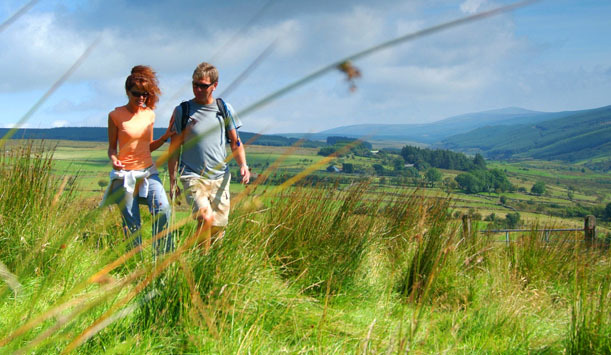 Best of all, this walkers’ wonderland is just an hour’s drive from either Belfast or Londonderry. The Sperrins’ Irish name, Cnoc Speirin (“pointed hills”), is in fact a bit misleading. These mountains are more of the gently-rounded variety, with the occasional rocky peak offering a view over fields, forests and waterways down below. There’s plenty for heritage lovers, too. Among the Sperrins’ best-known attractions are the Beaghmore Stone Circles near Cookstown – but these are just the start. 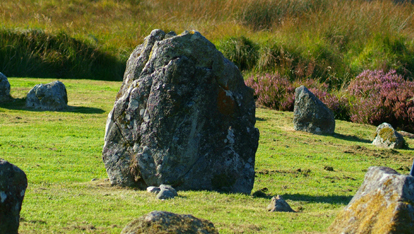 The area is dotted with thousands of standing stones and prehistoric tombs. According to legend, Northern Ireland’s largest mountain range is also where St Patrick, after banishing snakes from the island, trapped the last of their kind in a pool in Banagher Glen… so keep that shamrock close to hand! The Sperrins aren’t just a walkers’ paradise. Their heather-clad moorlands are also popular with horse-riders, cyclists, parachutists and gliders (the Ulster Gliding Club takes full advantage of the swirling air currents above Magilligan Point). An Creagán Visitor Centre nearby also offers a family-friendly interpretation of the surrounding bogland. It’s not just archaeological treasure you’ll stumble across, either. Did we mention the gold? Nuggets were first reported here in a river here in 1657, and today there is a gold mine at Curraghinalt. Gold has been spotted in several other locations – so keep your eye out for tell-tale twinkles!